Holly Farm01597 822 402work FarmhouseHolly Farm is a working farm dating back to Tudor times and has been graciously modernised to offer luxury accommodation with a warm and friendly Welsh welcome. Relax in the comfortable lounge with its traditional furnishings and fine stone fireplace or sit in the walled conservatory and enjoy the peace of the garden. The spacious dining room has separate tables where guests enjoy traditional farmhouse cooking using home produced beef, lamb and fresh garden vegetables. The grid shows the prices and daily availability from Mon 22 Apr 19 to Sun 28 Apr 19. It's easy to check availability for particular dates; just use the calendar to choose the check in date, select the number of nights and click the 'Search' button..
Holly Farm is a working farm dating back to Tudor times and has been graciously modernised to offer luxury accommodation with a warm and friendly Welsh welcome. The nearby Victorian spa town of Llandrindod Wells has golf, tennis, bowls, pony trekking and fishing. Taste of Wales and AA 4 Diamonds awards. 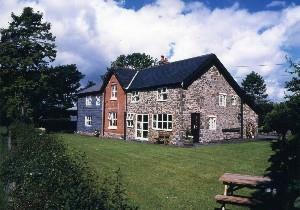 Howey is situated 1 1/2 miles south of Llandrindod Wells on the A483. Take turning right opposite Howey village, if travelling south. Holly Farm is 1/4 mile on left hand side.